When the railway was first built, a level crossing was provided at the south end of Oxenholme Junction station to maintain road traffic access along the old Kendal to Sedbergh turnpike road. 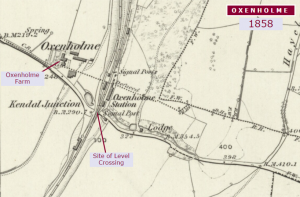 When the station was rebuilt in 1880/81, the level crossing was replaced with a pedestrian subway and a horseshoe-shaped road bridge. In 1968, the height of the road bridge was raised ahead of electrification in 1971.